For a map to the Island Training Facility CLICK HERE. Here's a little history of the island. In 1966 Don Ford, SEO Diablo Power Squadron, decided to teach the Public Boating Course, 'ABC America Boating Course' in Stockton. Jerry Schnor, Gerrit Bod, and Charlie MacNear, all Past Commanders, took the course that year along with several others. After successfully completing the course Don recruited some of the students, which included, Jerry, Gerrit and Charlie to join the Diablo Power Squadron. The next year Don recruited Charlie to teach the Public Boating Course in Stockton at Stagg High School for Diablo Power Squadron. Charlie taught the course for three years for Diablo, the number of students that successfully completed the course was growing. 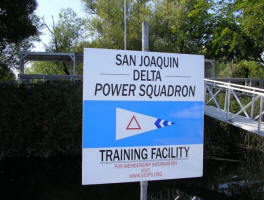 The Stockton residents that were Diablo members decided to establish the San Joaquin Delta Power Squadron and wanted an island like Diablo had. The hunt was on; a duck club had a lease on Lost Lake Island (AKA: Ward Island) with the Port of Stockton. The duck club agreed to lease to SJDPS the east side of Lost Lake Island, in 1970. Charlie was Island Chair in 1973 and the duck club significantly raised the lease fees. Charlie became curious and researched the State Land Commission records and discovered that the land the Squadron was leasing from the duck club actually belonged to the State of California. All lease payments to the duck club were terminated and Charlie started negotiations for a lease from the State. The lease was finalized in 1976 and is still in effect today. The Training Facility is located adjacent to the San Joaquin River (Stockton Deep Water Channel) northeast of Red Buoy Marker #16. To visit the island navigate between the two 5MPH signs, the docks will be on your port side, the north dock has more water depth than the south dock. The aquatic weeds are maintained 150 feet out in front of the dock. The Training Facility is utilized by our Education Department with 4 Partners in Command classes on the third Friday and Saturday of June, July, August and September. The ABC class has 2 cruise outs per year. There are organized events held at the island throughout the year that include Memorial Day Weekend, Fourth of July, Labor Day Weekend with safety demonstrations, and an annual spring clean-up event. Please fly your burgee when entering to dock, remember to leave the island cleaner than you found it.